As noted in previous articles, such as ABVLM: Vision & Value and the 2017 VLM Fellowship Development Update, significant gaps exist in current training programs in venous and lymphatic medicine. For several years ABVLM has been taking steps to foster and promote development of one-year VLM fellowships in order to address these gaps. In addition, such fellowships are critical to the advancement of the specialty and ultimately to achieving specialty recognition. The ABVLM Accreditation and Oversight Committee, chaired by Dr. Mark Meissner has developed an application review process and designed oversight processes, including site visits, which have been conducted at all VLM fellowship sites. 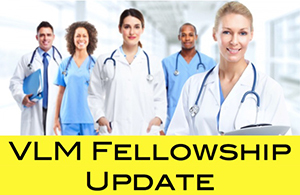 They will soon release a revised and simplified application to host a VLM fellowship. The Fellowship Development Committee is focusing on promotion and development of fellowship programs, and is happy to report what we believe will be an historic meeting in Nashville to be held just prior to the 2018 American College of Phlebology Annual Congress. Many ABMS Boards are modifying their recertification programs, replacing the every 10-year formal exam with what many believe are better and more relevant learning and assessment models. The American Board of Anesthesiology led the way with their MOCA Minute™, and other medical boards are following suit with similar programs. In August 2018, the ABVLM launched its own Online Learning & Assessment (OLA) program in lieu of the 10-year pass-fail exam. The board felt this was a better way to provide ABVLM diplomates an opportunity to continuously learn about important areas of venous and lymphatic medicine. The OLA platform consists of four exam-style questions per month that are delivered via email to all diplomates. Once a diplomate selects their answer from the multiple-choice options, they are immediately provided feedback as to the correct answer, an explanation of the rationale, and references to additional, frequently online resources. The OLA system, accessible from computers, tablets, and phones, allows diplomates to review past items, or items from specific topic areas. The board agreed that this program, requiring only 5 minutes per month to answer four items, would be of much greater benefit than requiring a 4-hour, 200-item exam every 10 years. The decennial recertification exam measures physicians’ knowledge base at a point in time every 10 years, but does little to help them retain or reinforce learning during the years prior to the exam. The OLA offers a more relevant and personalized approach to helping diplomates assess their knowledge and address knowledge gaps in an ongoing fashion. The “grading” of the ABVLM OLA program is currently based simply on participation. The board policy is that all diplomates must participate in the program in order to maintain their certification. The board will be looking at aggregated statistics for items, intending to provide feedback to the educational arms of venous- and lymphatic-related medical societies so their programming can address areas of need. All diplomates should be receiving an email at the beginning of each month with the subject line of: “ABVLM Certification - OLA Monthly Items for Review.“ Within that email is a link to a third-party, internet-based program where the four items are presented after securely logging in. Diplomates need not answer all the questions in one session, but the board expects everyone to complete the 4 items within the month the link is provided. The system sends reminder emails automatically if you have not started the items within two weeks’ time. If month end is approaching and the assignment is incomplete, another email reminder is sent. If you have not been receiving these OLA monthly emails starting in August 2018, please contact the ABVLM headquarters office immediately so we can address this. Diplomates can provide a secondary email address for just the OLA Program, if that works better for their workflow. Some have asked how long the OLA program will run. Since it is a replacement for a decennial recertification exam, the program is intended to run indefinitely, for as long as a diplomate wishes to maintain their ABVLM certification in good standing. Diplomates who do not participate in OLA will be flagged as Not Participating in MOC to any third-party verification service (such as hospitals, third-party payers, state medical boards, patients, or any other credentialing agency). Over a longer time period, diplomates in non-compliance risk their certification lapsing. The board believes that any diplomate should be able to find 5 minutes per month in order to review these educational offerings. References for additional learning are provided. This valuable, educational program which replaces the 10-year exam will be of great benefit now and in the future to educate diplomates on important aspects of venous and lymphatic medicine, and will help fulfill our goal to promote life long learning. Are you attending the American College of Phlebology’s 32nd Annual Congress in Nashville, Tennessee? If so, here are important aspects of the ACP Congress for ABVLM Diplomates. If you’ve not registered but intend to, note the 10% Off discount code in this article. On Thursday evening, November 8 from 7:00PM – 7:30PM, the Board of Directors will host a "Meet & Greet" at the ABVLM Booth in the Exhibit Hall (Booth #218). This is an opportunity for you to meet and discuss the ABVLM with your leadership, and to bring colleagues who may not yet have certified and might have questions about the ABVLM. You worked hard to earn your ABVLM diplomate status, so let’s celebrate it! You should receive an ABVLM Diplomate ribbon in the registration packet that you obtain onsite from ACP Staff. If it’s not there, please either ask the ACP Staff for one, or stop by the ABVLM Booth in the Exhibit Hall. We’re booth #218. Do you still have your ABVLM Lapel Pin? Why not bring it and wear it at the Congress? If you can’t find it, stop by the ABVLM Booth to get a replacement pin! Also, be recognized from the podium! On Friday, November 9 @ 3:55PM, Dr. Anthony Comerota will be the concluding speaker of the Healthcare Policy and Quality segment in the General Session. Dr. Comerota will present his talk on how certification and the ABVLM serve the patients well. He will then ask the ABVLM Diplomates in the audience to rise to be recognized. Did you know the ABVLM booth has two banners with all diplomate names, over 800 of them, listed on a “Wall of Fame”? Please stop by, see your name, take a picture for your social media feeds, or to send to folks back home. As always, if you have colleagues who have yet to certify in Venous & Lymphatic Medicine, please show them the ABVLM flyer in the Congress Registration packet and have them stop by the ABVLM Booth during one of the three lunch sessions: Thursday-Saturday from 11:00AM to 1:30PM, or at Thursday’s Opening Night Reception, from 6:30PM to 9:00PM. The ACP Leadership has offered ABVLM Diplomates a special 10% Off the Regular Congress Rate. So if you missed the “early registration,” here’s an opportunity to save and still attend. Staff and the entire volunteer leadership look forward to seeing you in Nashville. We hope you will encourage others to support our specialty and our patients by becoming VLM certified in April, 2019. Congratulations to the ABVLM Diplomates listed below who who passed the 2018 exam (89% pass rate) or had been Board Eligible and have now earned Diplomate status. There are now 821 physicians who have achieved ABVLM Diplomate status since the program's inception in 2008. All ABVLM exams undergo rigorous psychometric evaluation by Measurement, Inc. The 2018 exam consisted of 200 multiple-choice items. Following a detailed analysis of every item, 16 items were removed from scoring because of poor performance. The examination was then scored and analyzed. The 2018 examination had a candidate separation reliability of 0.84, which suggests it sufficiently distinguished among candidate abilities. Copyright © 2018 - The American Board of Venous & Lymphatic Medicine. All rights reserved. Copyright © 2018 The American Board of Venous & Lymphatic Medicine, All rights reserved.